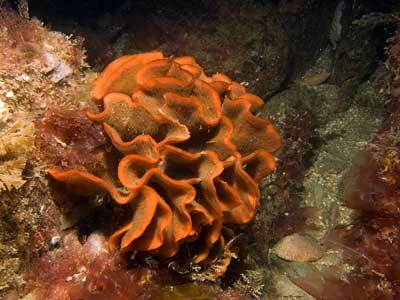 Description: This is the largest bryozoan to be found around our coasts, growing to 40cm or more across. The colony consists of a series of brittle plates joined to each other to form a domed or hemispherical colony. 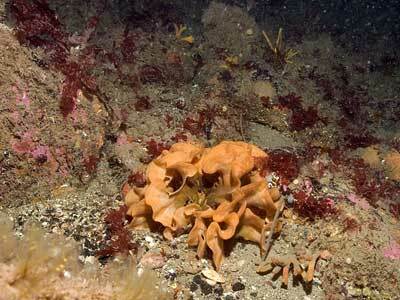 Small colonies start by encrusting the rock and then growing a series of upright plates. Distribution: A common species in the southern part of Ireland and the British Isles, becoming more scarce in Scotland, but recorded as far north as Lewis in the Outer Hebrides. Similar Species: No other species in the area forms large upright lamellate colonies. 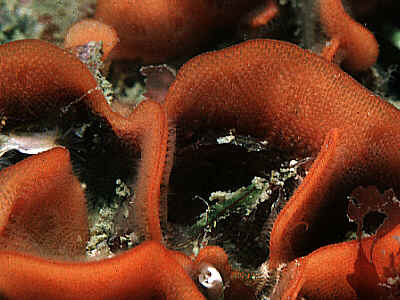 Smittina landsborovii is normally an encrusting species, but can grow small two-sided, convoluted plates which look like the start of a Pentapora colony. Plate-like colonies joined to form a hemispherical colony. Picton, B.E. & Morrow, C.C. (2016). Pentapora foliacea (Ellis & Solander, 1786). [In] Encyclopedia of Marine Life of Britain and Ireland.